Nanoporous Materials IV contains the invited lectures and peer-reviewed oral and poster contributions to be presented at the 4th International Symposium on Nanoporous Materials, which will be hosted in Niagara Falls, Ontario, Canada, June 7-10, 2005. 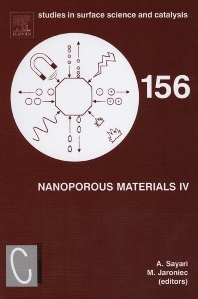 This volume covers complementary approaches to and recent advances in the field of nanostructured materials with pore sizes larger than 1nm, such as periodic mesoporous molecular sieves (e.g., MCM-41 and SBA-15) and related materials including clays, ordered mesoporous carbons, colloidal crystal templated materials, porous polymers and sol gels. The broad range of topics covered in relation to the synthesis and characterization of ordered mesoporous materials are of great importance for advanced adsorption, catalytic, separation and environmental processes as well as for the development of nanotechnology. This volume contains over 120 contributions related to the synthesis of ordered mesoporous silicas, organosilicas, nonsiliceous inorganic materials, carbons, polymers and related materials, their characterization and applications in adsorption, catalysis and environmental clean up. Mietek Jaroniec received his MS and PhD from M. Curie-Sklodowska University, Poland, in 1972 and 1976, respectively. Since 1991 he has been a Professor of Chemistry at Kent State University, Kent, Ohio (USA). Before joining Kent State he was a Professor of Chemistry at M. Curie-Sklodowska University, Poland. His research interests revolve primarily around inter-disciplinary topics of interfacial chemistry, and chemistry of materials, including physical adsorption at the gas/solid and liquid/solid interfaces, adsorbents, and catalysts. At Kent State he has established a vigorous research program in the area of ordered nanoporous materials such as ordered mesoporous silicas, organosilicas, inorganic oxides and carbons, focusing on their synthesis and environmental and energy-related applications.